Nativ is a serious hi-res music and video streaming system | What Hi-Fi? Multi-room audio and networked music players aren’t a particularly new concept, but the Nativ Vita aims to combine them both into a seamless, high-end, hi-res package. 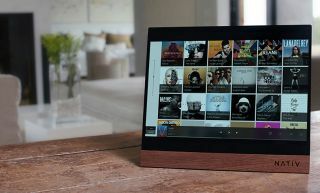 The Vita is a 11.6in touchscreen-controlled central hu, which supports music and video streaming services including Apple Music, Spotify, Tidal and YouTube. As well as streaming, the Vita system allows access to locally stored music on a NAS drive, smartphone or its own 4TB of internal storage (upgradeable), and can distribute it all to wireless speakers and headphones around your home, including high-resolution audio. DLNA and UPnP products are supported. Multi-room speakers and wireless headphones from the likes of Bose and Sonos are supported, connecting via wi-fi or aptX Bluetooth. Spotify Connect, Apple AirPlay and Google Cast are all supported, too. It can also connect to your existing hi-fi equipment via asynchronous USB 2.0, SPDIF (RCA, TosLink, BNC) or AES/EBU XLR, and supports up to DSD 256, DXD and 32-bit/384kHz PCM music files. Nativ has said it plans to support MQA in the future, too. Whilst you can control all your music via the central hub, Nativ also offers smartphone and smartwatch apps and you can even control everything through your TV. It’s not just music you can stream either, as Nativ supports music video streaming to your TV from YouTube, Apple Music, Google Play and Tidal, via Google Cast or HDMI. There's also a dedicated DAC and headphone amplifier, the Nativ Wave, which has two 24-bit/192kHz DSD1792A modules, and a Nativ Pulse power supply. So the company means business. The Nativ Vita system is currently seeking funding on Indiegogo, where it has surpassed its $100,000 goal with two months to go. You can pre-order a Vita for $999 plus shipping.